Vegas on the Edge! | UNIGLOBE Direct Travel Ltd.
You think you're big-time? Prove it. You think you're big-time? Prove it. Anyone over a certain height can ride a roller coaster, but it takes a real man (or woman) to swim with the sharks in the Shark Reef Aquarium at Mandalay Bay. There are no cages - just you; 1.3 million gallons of underwater real estate; and more than 30 sharks, including sand tiger, sandbar and whitetip reef sharks. So, you can swim with the fishes. Can you fly like an eagle? For some zip lining, head out to Boulder City for Bootleg Canyon Flightlines. Soon, you'll be able to go from one hotel tower to another at the Rio with the Voodoo Zipline. If that's not enough, try the new Slotzilla zip line right through the heart of the Fremont Street Experience. And just because you're tall enough to ride a coaster doesn't mean you can handle just any roller coaster. Head down to Buffalo Bill's in Primm and see how you hold up against the Desperado's Turbo Drop, a 255-foot nosedive that highlights one of the world's tallest and fastest scream machines. Or twist, loop and dive around New York City with the Coney Island-style coaster at New York-New York. But if tales about you usually begin with, "Did you hear what crazy ________ did this time?" you'll want to go even higher. The SkyJump at the Stratosphere is happy to oblige. 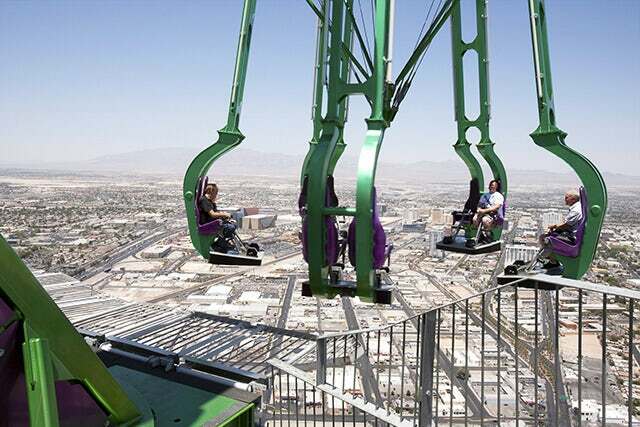 At 108 stories, it's the highest controlled free fall in the world. It really is the best way to see the city - hurtling toward earth at a ridiculous speed. Also at the top of the tower, you'll find the X-Scream and Insanity waiting. If you have a need for speed, this will get you revved up - the Richard Petty Rookie Driving Experience at Las Vegas Motor Speedway is your chance to race like a NASCAR pro. Or go off-road with a Desert Adventure ATV tour and explore! Now that you've defied gravity, ignored speed limits and challenged your better judgment, why should your mouth get off the hook? Are you up for the food challenge of your life? Try the eight-pound burger challenge at The Pub inside the Monte Carlo Resort. Finish The Pub Challenge in 30 minutes and it's free - and you get a free T-shirt (XL might be needed)! Piled high with vegetables and topped off with a giant bun, it won't be easy to finish, but if you do, your name will go down in the Monte Carlo history books forever! Or, forget counting your calories for a day and indulge at the Heart Attack Grill on Fremont Street. The Double Bypass Burger, Flatliner Fries and Butterfat Shake, boasting the world's highest butterfat content, speak for themselves. Now that's living Vegas on the Edge!